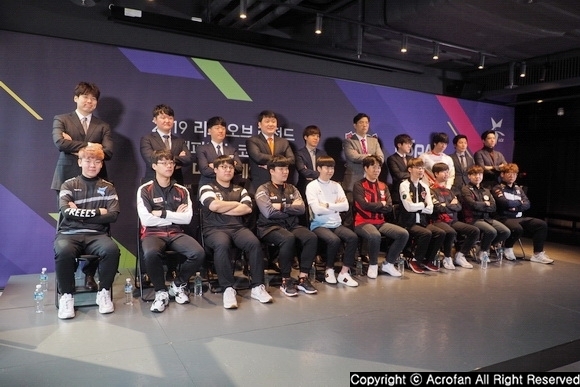 On January 11th, Riot Games held '2019 LoL(League of Legends) Champions Korea Spring Media Day' at LoL Park in Jongno-gu, Seoul. 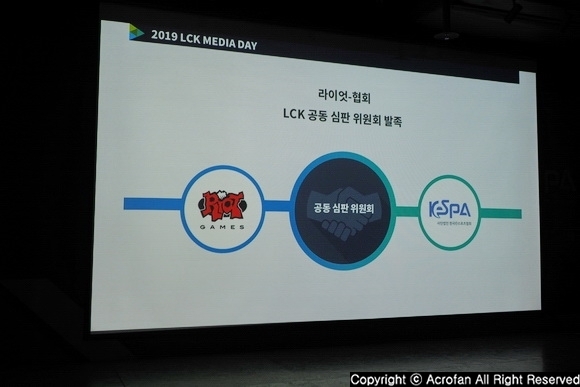 Ahead of '2019 LoL Champions Korea Spring (2019 LCK Spring)' that will be held from January 16th, the event was organized to introduce the features of league management, with the officials including Jun-kyu Park, Korean representative of Riot Games, Sang-heon Oh, director of esports business, Cheol-hak Kim, secretary general of Korean eSports Association in attendance. ▲ '2019 LoL Champions Korea Spring Media Day' was held. As the first order, the operation policy of '2019 LCK Spring' was introduced. 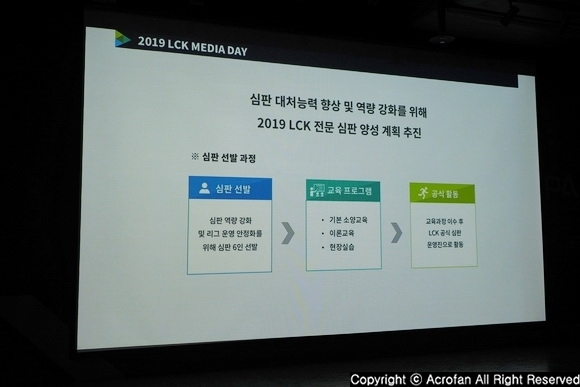 According to the announcement, '2019 LCK Spring' consists of a total of two rounds, with the first round being five days a week from Wednesday to Sunday and the second round being four days a week from Thursday to Sunday. Likewise, the league will be held from January 16th to March 31st, and the playoffs will start on April 3rd. The winners will be determined by the finals on April 13th. 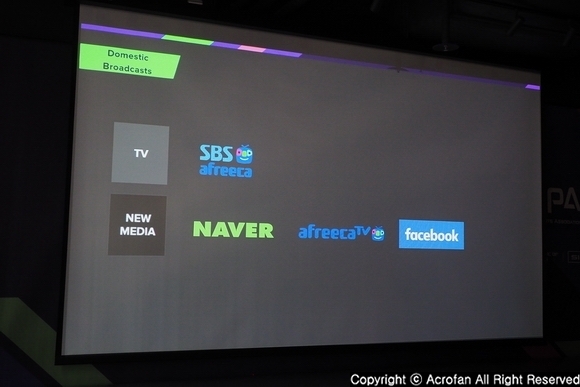 Broadcasting of '2019 LCK Spring' can be seen on TV cable channel SBS Afreeca and new medias such as Naver, Afreeca TV, and Facebook. In the case of foreign language broadcasts, Chinese version will be broadcasted on Huya TV, English on Facebook and Twitch, French on OhGaming, Japanese on OPENREC.tv, and German on Summoners' Inn. 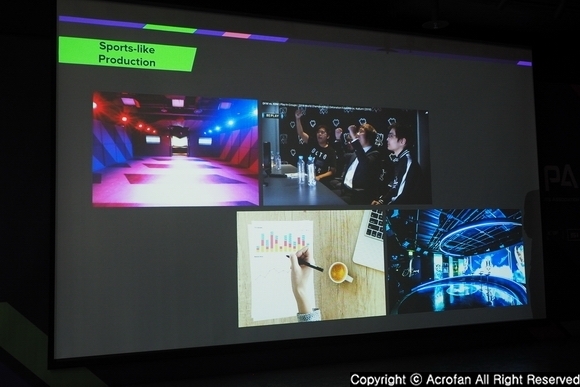 Moreover, the organization of the stadium and the contents of '2019 LCK Spring' are being prepared with the aim of showing like sports as much as possible. It was highlighted that a coach box where coaches, coaching staffs and waiting players are located, and an analysis desk that analyzes the progress of the game will provide more excitement to users through this season. Besides, since the round stadium is structured with open-type booths, white noise and sound curtain system will be actively utilized to thoroughly separate the sound of the audience and that of the stage. ▲ The league will start from January 16th, and the winner will be decided by the finals on April 13th. ▲ TV and new media broadcasting channels were introduced. 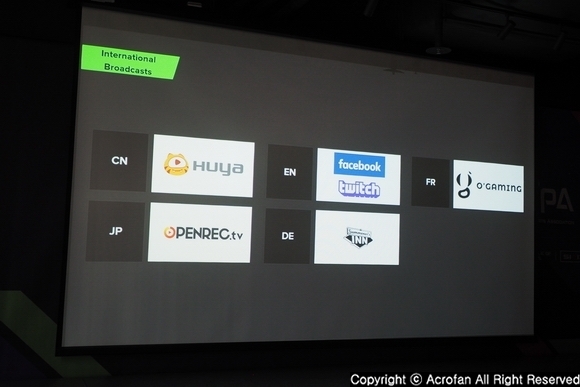 ▲ International broadcasts will be also available in five languages. ▲ The goal is to show like sports as much as possible. On the other hand, regarding the game judgement, Riot Games and Korean eSports Association will organize a joint judgment committee for unifying the process. This is because referee's decision and confirmation by management had to be done separately in the past. The joint judgement committee of each competition will be composed of six referees including technical referees dispatched by Riot Games and game referees by Korean eSports Association. They will perform tasks such as field management before the match, game operation during the match, and game analyzation after the match. 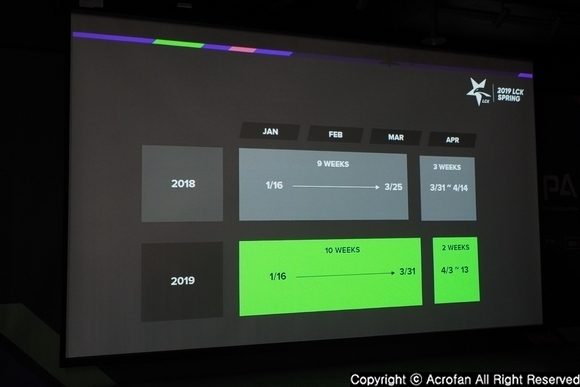 Meanwhile, for enhancing coping abilities and reinforcing capabilities of the referee, '2019 LCK Professional Referee Training Plan' is being pushed forward. As a method of training the referee in accordance with this plan, six referees are selected, and the training course consisting of basic courtesy training, theoretical education and field education has to be completed. After the training, the selectees will be working as an official LCK referees. ▲ Riot Games and Korean eSports Association will organize a joint judgment committee. ▲ '2019 LCK Professional Referee Training Plan' is being pushed forward. Following the operation policy of '2019 LCK Spring', the second order was prepared to listen to the coaches and players' commitments and determinations to this season. (Afreeca Freecs 'Spirit' Da-yoon Lee) Beginning this spring season, we will prepare hard to make good results in domestic and international competitions. (Afreeca Freecs Coach Yeon-sung Choi) We aim to achieve better results than last year, and we are preparing for the best. (kt Rolster 'Smeb' Kyeong-ho Song) LCK is likely to be fierce this year. As many new players have come in, we are working hard with a new mind. (kt Rolster Coach Chang-jong Oh) We want to show a better performance by achieving parts that we could not make last year. Since new players have come, we want to show the experienced kt and new kt as well. (Gen.G Esports 'CuVee' Sung-jin Lee) As I did not show a good picture at LCK last year, I will try to show a better picture this year. (Gen.G Esports Coach Woo-beom Choi) I believe the results will be better if we enjoy, so we will enjoy the match this year. (Hanwha Life Esports 'Sangyoon' Sang-yoon Kwon) I am practicing hard to show a good performance. I ask a lot of encouragement. (Hanwha Life Esports Coach Hyun-jong Kang) We want to go higher than the last season. We'll do the best. (Damwon Gaming 'Nuclear' Jong-hyun Shin) We have been receiving much attention with the promotion to LCK. I will take both cheering and criticism as stepping stone and try hard to show a better performance this season. (Damwon Gaming Coach Mok-kyung Kim) As a new LCK player, I will always try to learn. I will try my best and prepare the season. (Sandbox Gaming 'Joker' Jae-eup Jo) We want to get positive results with a perfect match, and become a team receiving positive comments. (Sandbox Gaming Coach Ui-joon Yoo) I want to know how far we can go up with our own style. (SK Telecom T1 'Faker' Sang-hyeok Lee) The results at KeSPA Cup left much to be desired since we just had gotten togerther as a team at that time. But, in the spring season, we will come back with a better performance. (SK Telecom T1 Coach Jung-kyun Kim) This season we want to show performance that fans will be satisfied with. (Griffin 'Sword' Sung-won Choi) We will make much effort to show good performance in LCK as KeSPA Cup. (Griffin Coach Dae-ho Kim) We will fight hard with other teams and win-win each other to increase global influence. (Jin Air GreenWings 'Stitch' Seung-ju Lee) As various players have gathered, we want to work hard with our first intention. We will do the best in the direction of further development. (Jin Air GreenWings Coach Sang-yong Han) The aim is to make an aggressive team and receive positive evaluation. (Kingzone DragonX 'TusiN' Jong-ik Park) Kingzone DrangonX is a new team, so we will try harder to go higher. (Kingzone DragonX Coach Dong-hoon Kang) Since all players are working hard lately, I am going to prove that Kingzone DragonX is a remarkable team. ▲ There was time to listen to each team's coach and players' commitment to this season.